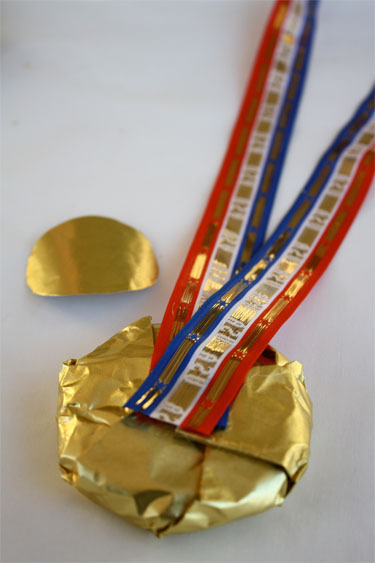 Go for the gold with these Olympic medal cookies! 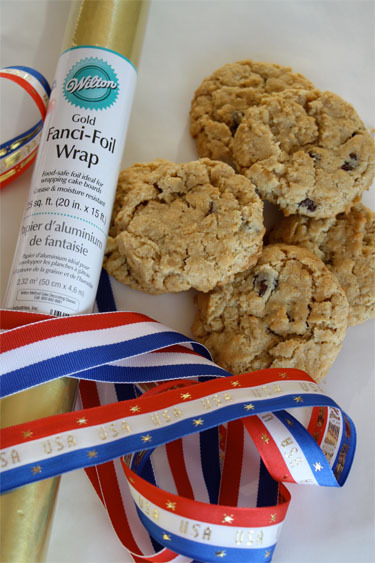 Make your favorite cookies and gather some gold foil, patriotic ribbon and hot glue. 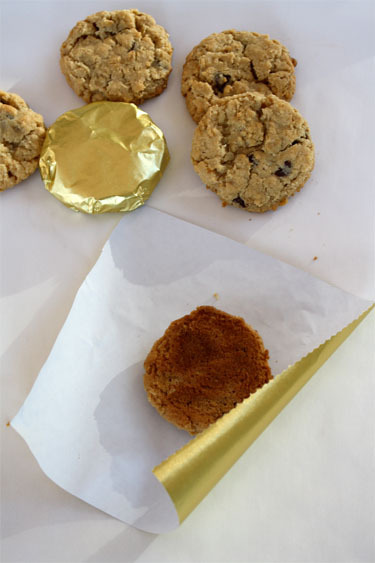 Wrap cookies in the gold foil. Fasten with a drop of hot glue, making sure not to touch the cookie. 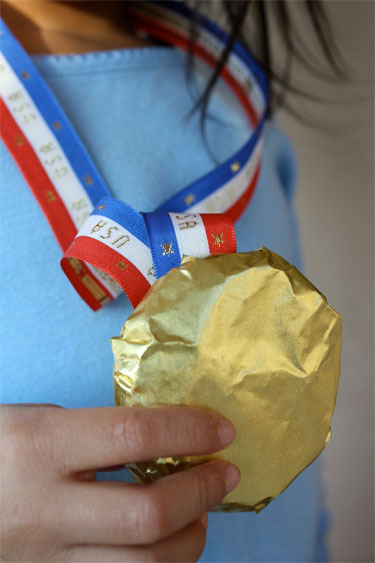 Attach ribbon to back of wrapped cookie with hot glue. 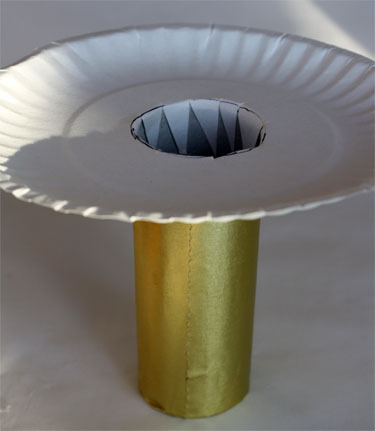 Finish off back by gluing a circle of the gold foil on top of the ribbon. Kids might want to embellish the front with a picture of their favorite sport. Get fired up with an Olympic torch! 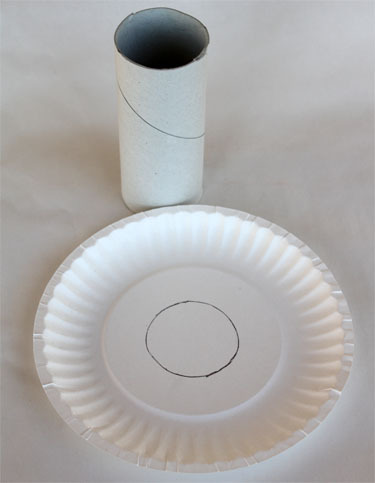 Draw around the end of a toilet paper tube in the center of a small paper plate. 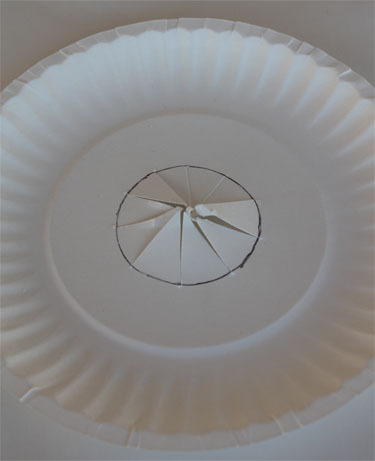 Pierce center of plate with scissors and cut slits to the edge all the way around the circle. 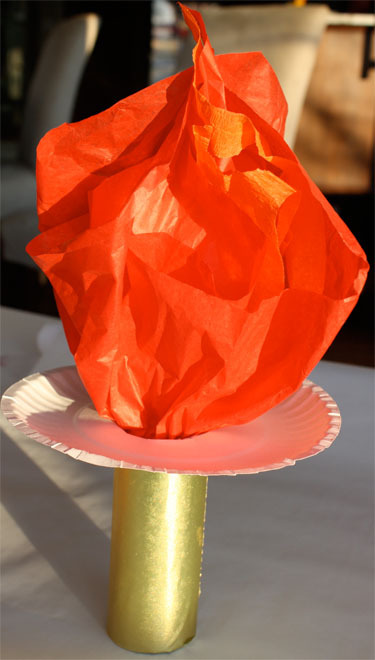 Stuff red and orange tissue paper into the center of the tube. I love this idea!!! I think I will make them as favors for my daughter’s b-day. We are planning on having it at her gymnastics school so this favor idea is greeat!! Thank you for sharing! 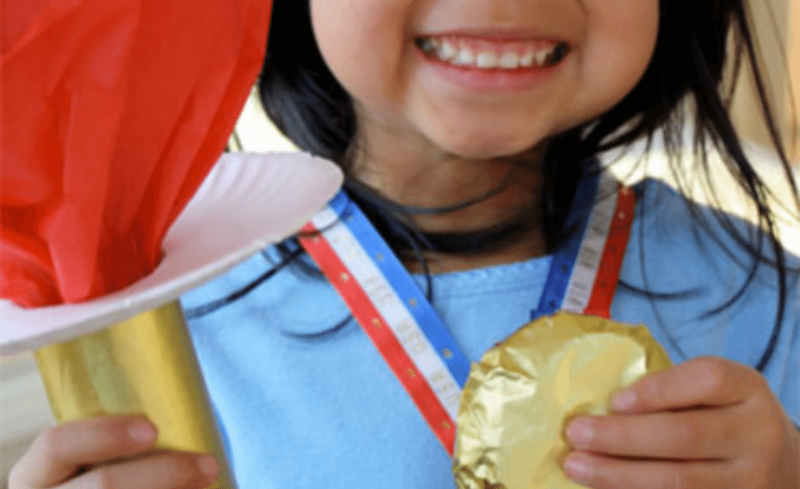 Editor: love the idea of party favors for a gymnastics party! 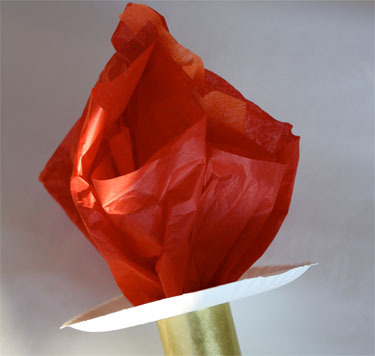 I love the olympic torch idea! So creative! What a fun way to get in the spirit! Wonderful idea! We are hosting a “Back-Yard” Winter Olympics for our Homeschool friends. We will definitely be using these adorable ideas! Thanks. Awesome! I’m going to use the torch idea with my second grade class. We are having our own Winter Olympic events next week. Thanks! I love the torch, I am going to do that with my little ones next week, thank you! Super cute! 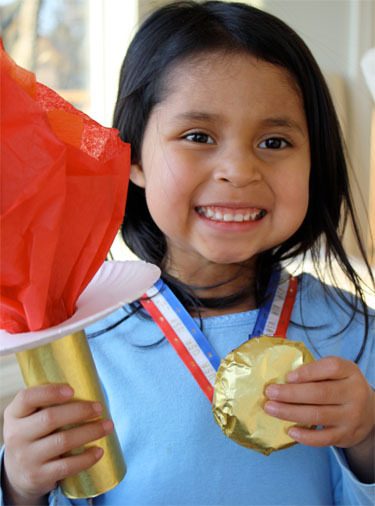 I would have loved to use your cookie idea when I did my little one’s Olympic theme birthday party in ’08 during the Beijing games. This is a great idea! I would though, use a dab of frosting to “glue” the foil together instead of hot glue just to be more careful. Very cute! What a cute idea!! 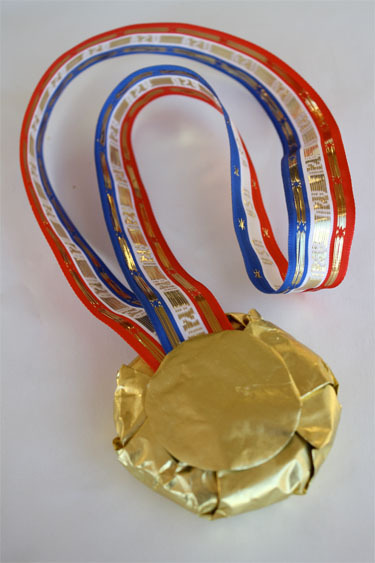 We just did an “Olympic-themed” birthday party for my son’s first birthday, and I’ll be sharing some Olympics crafts on my blog at http://oopsey-daisy.blogspot.com/. I love your creative ideas!! I have featured your ideas on my blog to share with others. Thanks for sharing your creativity! This rocks! But really, you can’t go wrong with cookies. :>) I linked to this on my weekly roundup, the post is under my name. Thanks so much for sharing! Anyone have suggestion on size of cookie and paper square and circle sizes? Thanks!